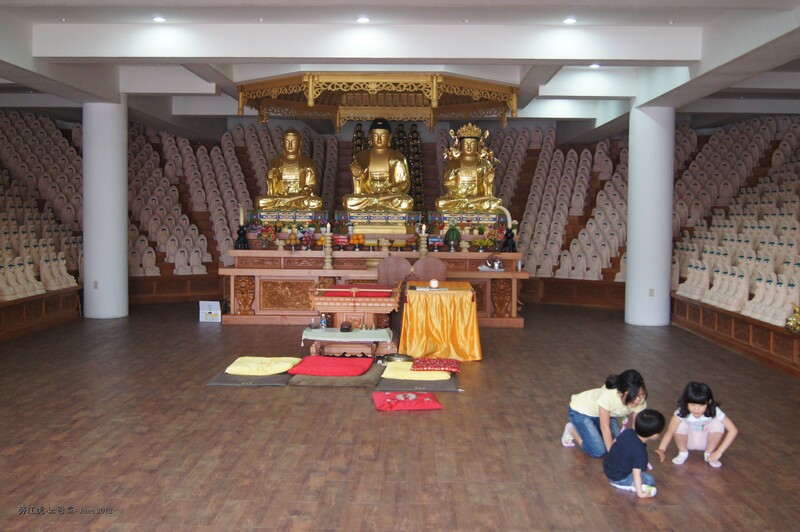 On Buddha’s Birthday, May 28th, I traveled out of Daegu to the nearby town of Ok-Po. 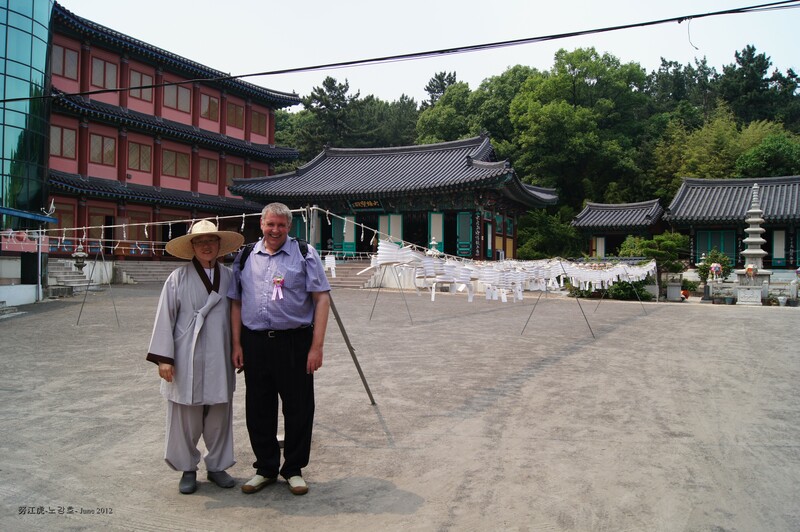 I was with a friend Jane, whose uncle is the senior monk in the Chang So temple (장수사) temple. As it transpired, almost every other person we met was one of her relatives. With a monk in the temple forecourt. Note the curved roofs. 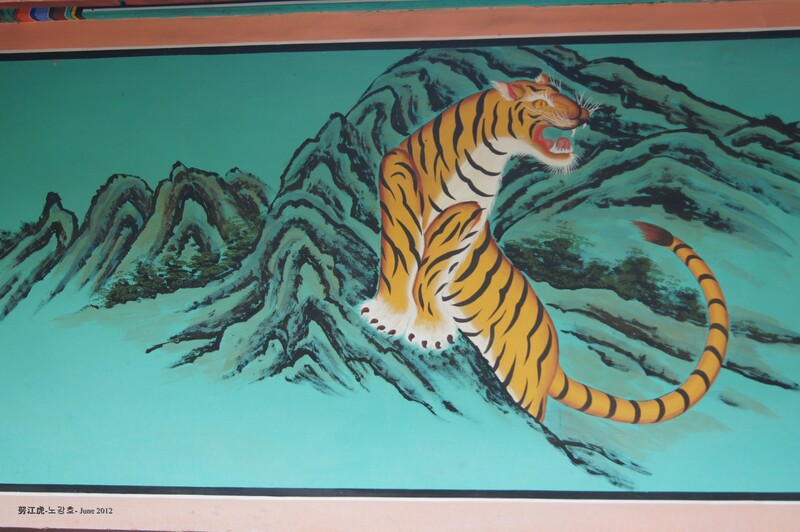 It was an interesting trip firstly because there were no mountains to climb (nothing spoils a trip more to a temple than an hour’s hike) and secondly, as the temple was small, it was quite calm and not teeming with visitors as a larger temple would be. We looked around the temple complex, lit joss sticks in the main temple and poured water over a small statue of Buddha followed by the traditional temple bibimpap (mixed vegetables and rice) in the canteen. Then we sat sat in the monks rest room and drank coffee. 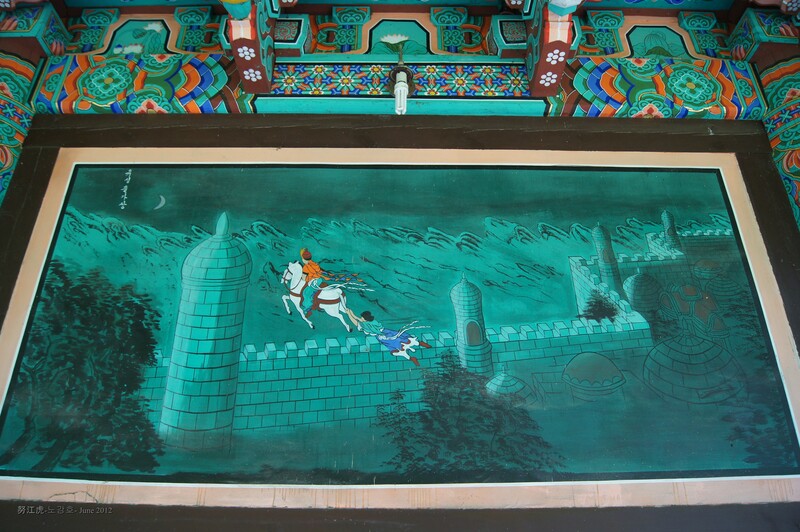 Temple buildings, traditionally built of wood and without nails, are always highly decorated and the narrative panels are exotic with their distinctive turquoise background. 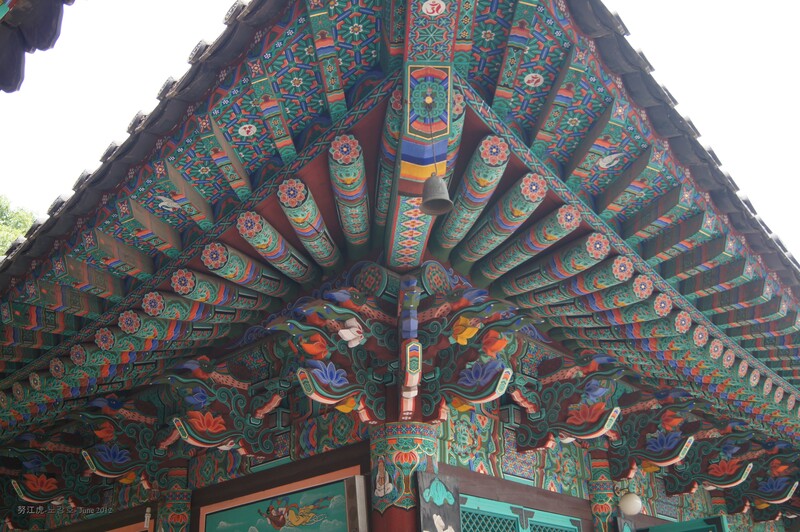 As there is a believe that evil travels in straight lines, the roofs of temples are curved to prevent evil entering them. Temple complexes house a main temple and then several smaller shrines dedicated to the various manifestations of Buddha. 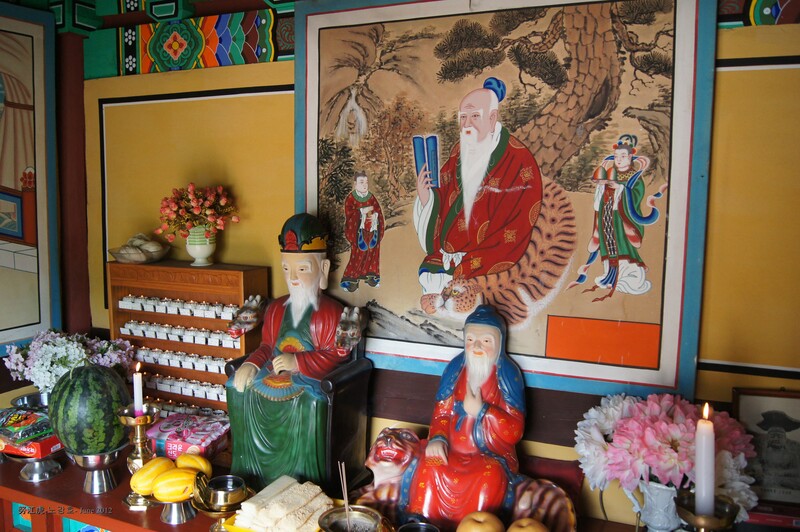 Usually, there is always small shrine dedicated to the Mountain God (산신) who was revered in ‘Korea’ before Buddha was born but has since become a manifestation of Buddha. 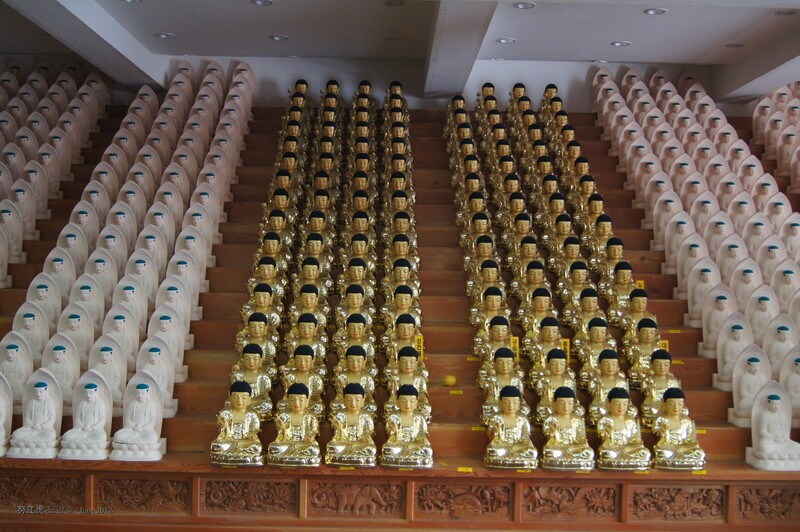 One of the larger shrines, the largest after the main hall, was filled with small statues. 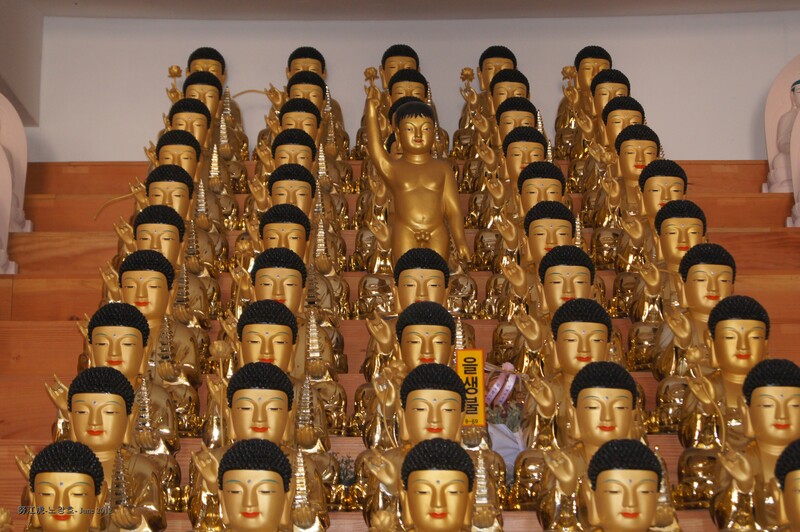 It was an incredibly impressive hall where the mesmerizing effect of row upon row of miniature statues induced a sense of serenity. 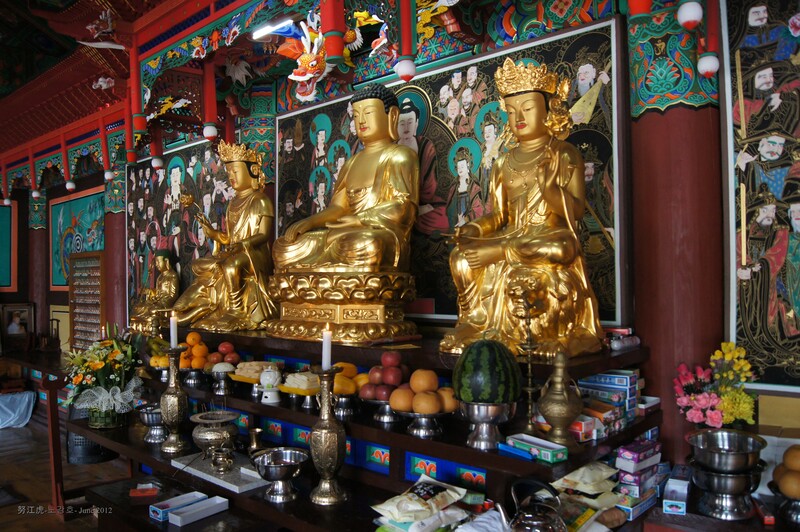 The main hall, a shrine to Ksitigarbha (지장 보살), the Bodhisattva. 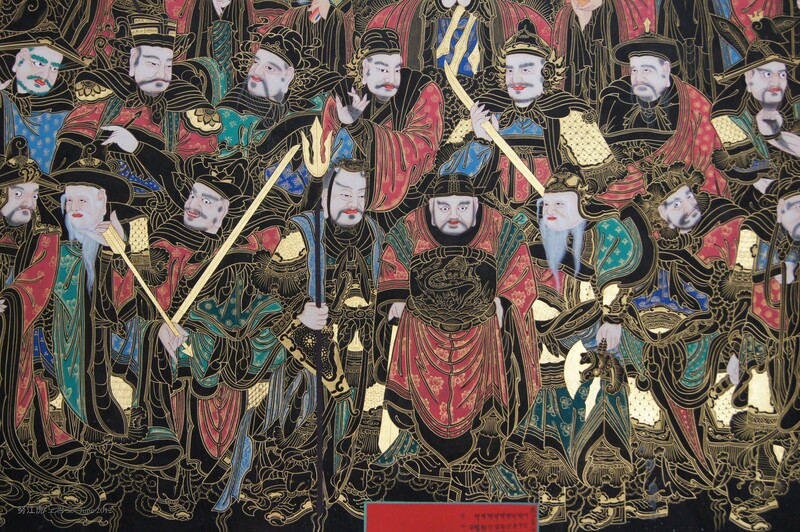 The hall contain depictions of heaven and hell and their associated judges. 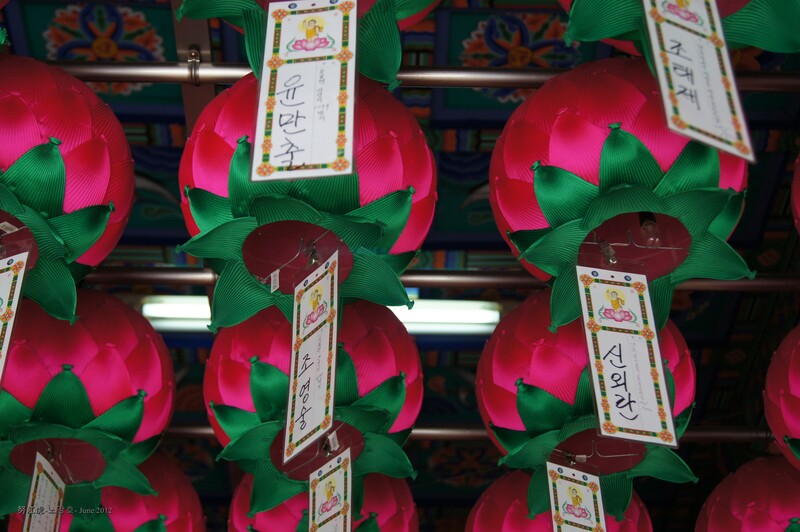 On the edges of the hall are small shrines to recently deceased people and hanging from the ceiling lanterns with attached wishes of devotees. 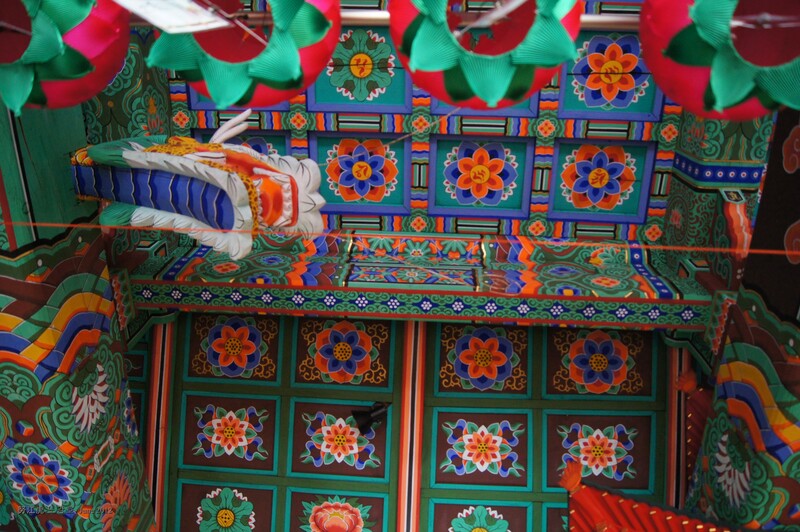 Korean temples are wonderfully relaxing. 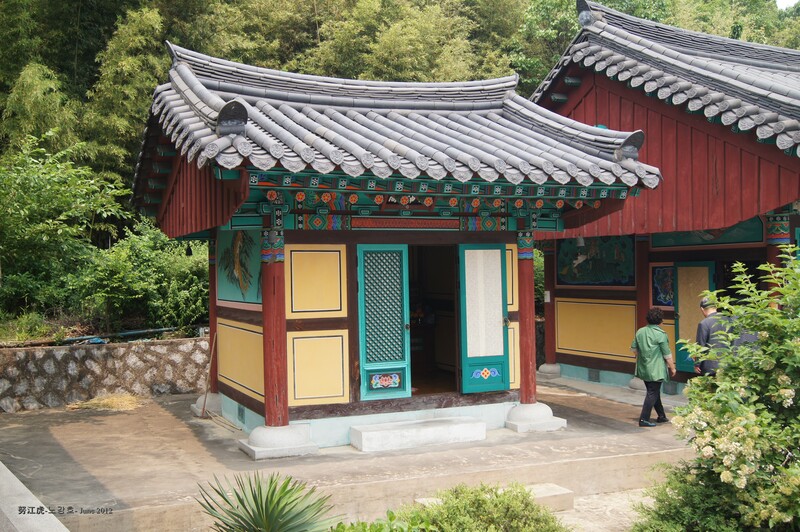 Usually located in the mountains or countryside, they are a respite from the hussle and bussle of city life. All the elements of a temple, from the art and architecture to the hypnotic chanting of a solitary monks, conspire to induce a sense of serenty and reflection. 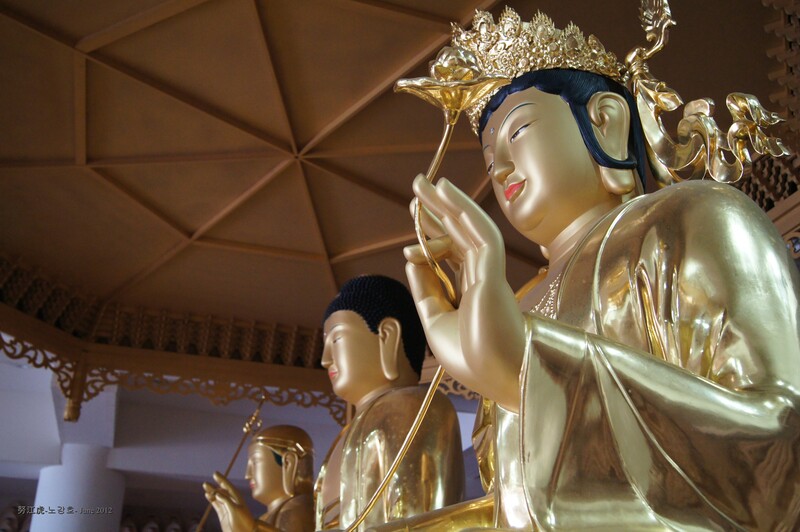 I would liked to have added much more information about the temple and its features but I do not know enough about Korean temples and Buddhism. The subject is quite complex and intense. Mind if I ask, what’s your religion?